← Monday Question – Is Your Perfume Hobby A Secret? 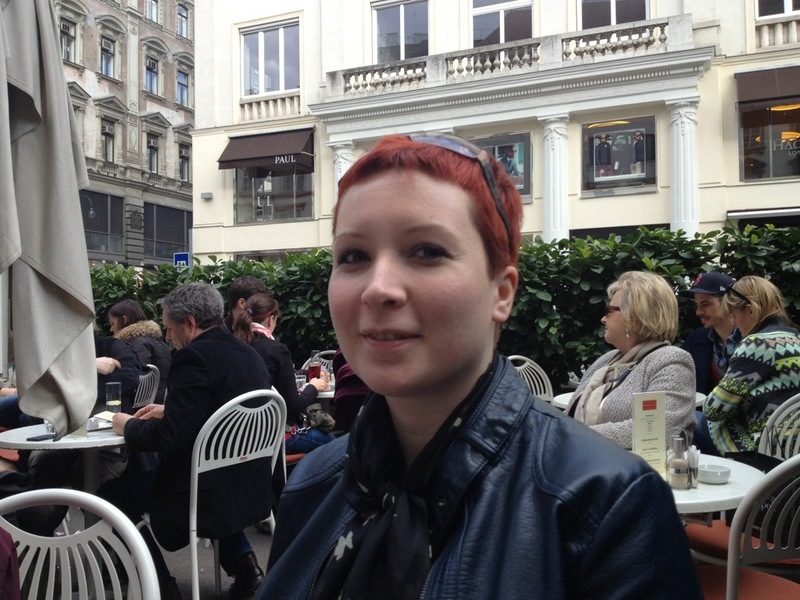 Ines of All I am – A Redhead visited Vienna this past weekend to compete in the Vienna City Marathon! What an admirable feat, she did so well. Bravo Ines! But the best part for me was getting to meet her. Despite me being a bit under the weather still, I hope Ines had fun. Important things coming first, after meeting up in the city center with my friend Sandra and her son, our first port of call was Le Parfum on Petersplatz where Ines bought a bottle of Atelier Cologne Vanille Insensée for a friend back home. Then, discreetly whining children in tow, we made our way through the first spring weekend – tourists en masse – marathon in town – throngs to a café, where we could sit outside and enjoy the sunshine. Niki promptly fell asleep, hard wire chairs notwithstanding, the pressure of meeting Ines finally falling off, he gave in to his delayed nap schedule. Ines and a very tired looking Olfactoria with an even more tired Niki, post nap. The ritual exchange of fragrant gifts ensued, and aside from gorgeous vintage samples (Balmain Vent Vert among them), Ines brought goodies from Croatia, I especially look forward to indulge in the sweet liqueur she brought. The kids were ecstatic about their chocolate filled goodie bags – thank you Ines! The younger generation had fun too – Paul and Sean. After refreshments, talk and naps, we moved on to Le Dix-Neuf in Seilergasse just around the corner, Vienna’s newest and coolest perfume boutique. I promise to finally write about it in detail next week! Ines emerged with a handful of mouilettes and smelling deliciously of Amouage Opus VI. My children were then done for the day, so we had to send Ines on alone to try the new Malle for Dries van Noten at Pure Day Spa on Tuchlauben. I was sorry that I had not been at my best due to us three still fighting some nasty and persistent bug, but I was glad I could meet Ines. Hopefully she’ll be back next year to run again! Many thanks to Sandra and Sean for accompanying us. Have you met online perfume friends in real life? Tell us about it! This entry was posted in Fragrance Reviews and tagged Croatia, Vienna, Vienna City Marathon. Bookmark the permalink. Ines, Dobra Veche! What a great adventure. AAAHH I wish I lived on the Continent to hang with you all more often. What a lovely day. Hi to Sandra too please Birgit. I wish you would live closer too! I keep trying to convince my husband that he should finance my trips abroad so that I can meet all my favorite perfume bloggers in Vienna, London, Paris, Sydney and New York. Haven’t had much luck, yet. Brava Ines! What an accomplishment finishing a marathon! I hope you and your boys are soon feeling much better. 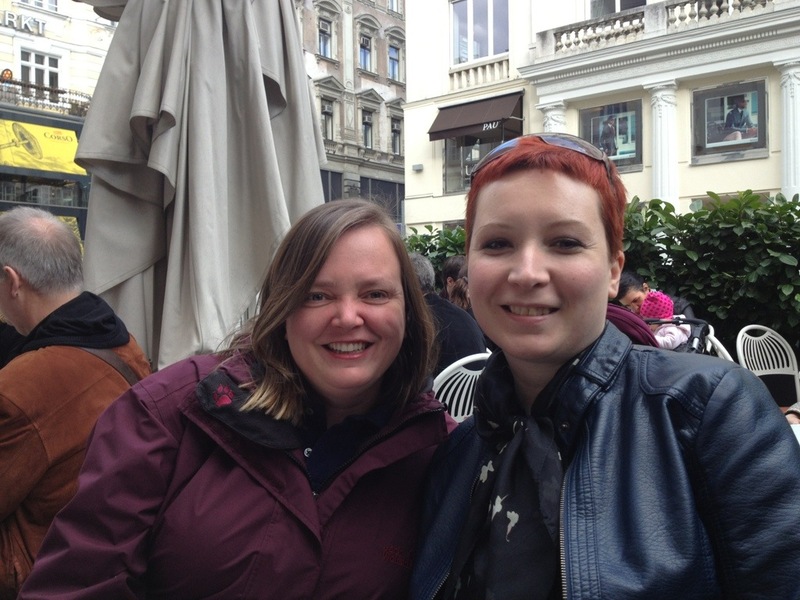 It was great fun meeting Ines and seeing you all again. Thanks for the wonderful afternoon. Congrats to Ines on a great run! Thank you for coming with us! Sean is the cutest!!! I had a great time and enjoyed meeting you and Sandra (and your boys!) immensely. Ines, I think I’d be dead if I tried walking even half-marathon! Bravo! Birgit, thank you for the story and pictures. I’d die a quick death as well, a half-marathon is impressive! That’s so wonderful, meeting virtual friends in real. Bravo Ines on running the marathon. Even half of it is too much for me. It is lovely, I feel so lucky! I am so relieved to hear that you were well enough to meet up with Ines as planned, and congratulations to her on her major running success! I will have to come back to Vienna sometime, because I note that a new perfume store has popped up since I was there last! Yes, you have to come again, Le Dix-Neuf is fabulous! And I would be so, so happy to see you again, dear V! Ines- Congrats on your accomplishment…even half a marathon is impressive in my book 🙂 !!! 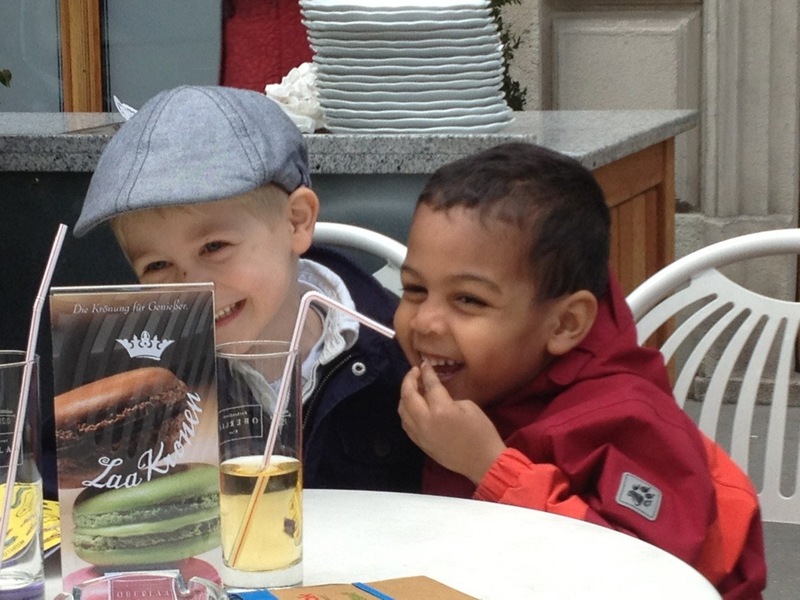 Birgit- thanks for sharing…I especially love the pix of the boys..too cute! There are many a perfume friend I would love to meet in person but unfortunately it has not happened yet! It took me a long time to meet a perfume friend in real life, but that is a good thing about life, sometimes it all fits together and suddenly it’s possible. I would love to meet a fellow fumie but so far I have only had virtual relationships. The question that would be running through my head beforehand is what perfume would I wear?? Thanks for the compliment, dear A.
I am new to all this and do not know any of you, but the description of the meeting sounds like so much fun, it is so warm. Especially on a tragic day like today (Boston), it is good to read these uplifting stories. How perfume can lead to friendships across the globe, isn’t that just a wonderful thing? And Ines: a half marathon is superb!! so thanks to all of you for putting a smile on my face today! thank you for reading and commenting, it’s lovely to hear a new voice. I’m glad you enjoyed this post, we can all use a smile today. Meeting up with perfume friends is the best! So glad you and Ines were able to get together. It sounds like a fun time was had by all, despite the nasty bug. Lovely photos too. Yes, maybe your partner wants to come back to rekindle old memories? I’d love to show you around! Enjoyed reading your account of the weekend, Birgit. I have not had the chance to meet any of my online fragrance friends yet. But I hope to be able to one day. How wonderful it would be to meet you and Ines, for instance! Oh, it’s a pity I didn’t know about your meeting, we could have made even a bigger fumie group. Especially, when you had so cute boys with you! I’m sorry, I should have asked if you were available, it would have been great for you to join us. Thank you for sharing your lovely visit! Just the word Vienna sounds so exotic, much less running a marathon there. You all looked so happy, the boys, too! I wouldn’t equate Vienna with exoticism, but it’s great to see from a different perspective. Wow, it makes my day seeing these photos!!! I’m impressed by how rested and relaxed Ines looks — whether these were taken before or after the half-marathon hardly matters, she looks radiant. And it goes without saying that she is in beautiful company with Birgit, Sandra and those cute-as-a-button boys! 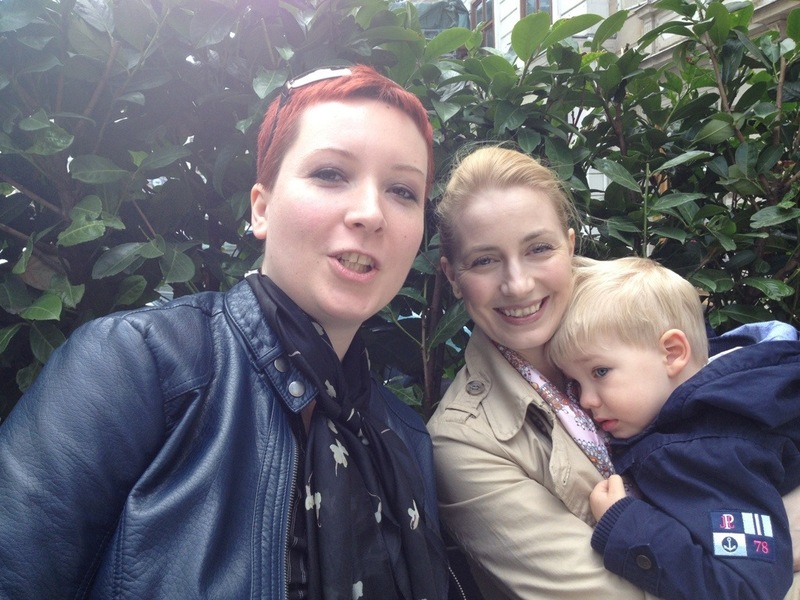 I’m looking forward to meeting up again with Ines and Asali in September, in Rome. Can’t wait! I wish I could come to Rome! You’ll have a wonderful time! Who knows, maybe a few from now, we’ll be able to organize a large meet-up of perfumistas. That would be so much fun! Congrats Ines on the half marathon! I can barely ride my bike across town these days, so you’re quite my hero. How fun that you all got to meet up!! Hoping that B and family feel 100% better soon. Thank you very much bloodyfrida. What fun! Looks like spring in Vienna – I’m jealous! 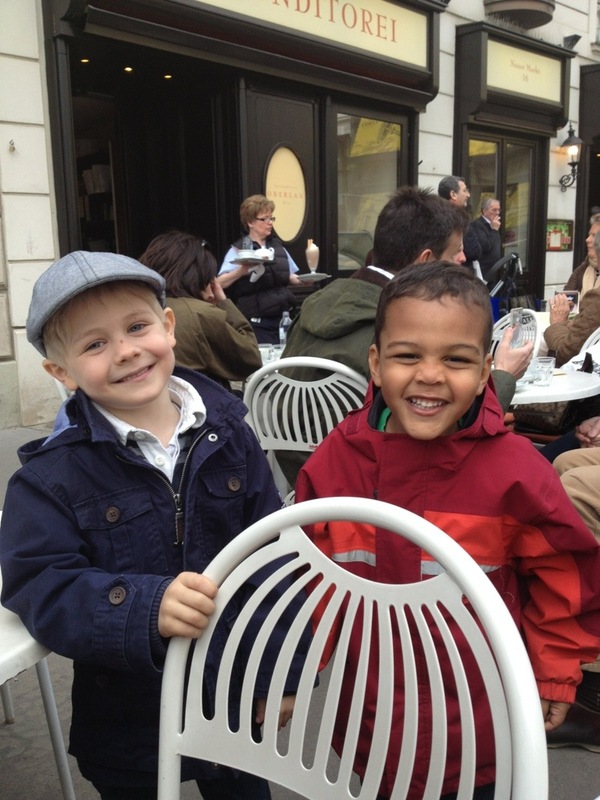 The pictures of the sweet babies stole the show in this post, Birgit! It was Ines’s fourth run of that length, that is really impressive. Sounds like you both had a wonderful time visiting! Congrats to Ines for the City Marathon. And thank you to Birgit (who I hope is feeling better) for sharing! These mean city streets will get so much more dangerous with a certain perfumista on the loose… watch out New York! City on alert! Perfume as Public Service Announcement incoming! All heirloom pigs should try to run for their delicious lives! aaaaGggh: vintage Vent Vert! That is one of my deepest missions! Please review it soon! Thanks for “taking us with you”! !